Mysuru: In a ghastly incident, a scooterist suffered injuries after being mauled by a pack of 6-8 stray dogs at around 11.30 pm at K.C. Layout in city, yesterday. The injured has been identified as Nazir Ahmed. Nazir, who was returning home from work, was attacked by the dogs resulting in him falling off his scooter and sustaining injuries on his legs and shoulders. Hearing his cries, students from nearby hostel rushed to his rescue and chased away the dogs. Later, Nazir was shifted to a nearby hospital. 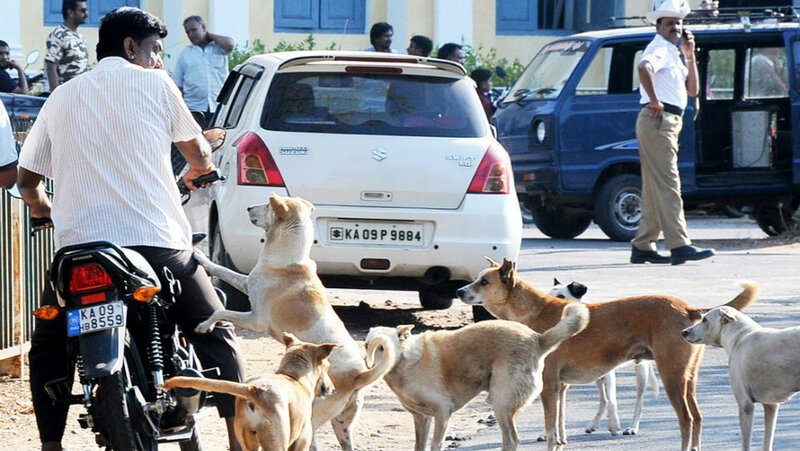 With tourists increasing to Chamundi Hill, there is also an increase in dog menace in K.C. Layout located at the foot of hill with visitors dumping the leftover food on the footpaths. Despite several complaints, none of the officials concerned from Mysuru City Corporation (MCC) have taken action to stop the dog menace. The residents have also complained that the MCC has not been collecting garbage regularly. It may be recalled that Nazir was attacked by the stray dogs at the same time when he was returning from work last year also. When Star of Mysore, spoke to local Corporator Vanitha Prasanna, she said that the matter would be brought to the notice of officials and assured action.